We made #3 in the Denver Business Journal Book of Lists 2017-2018! We love to see better health and nutrition in the spotlight! Welcome back! We've spent the summer hard at work preparing a great first semester menu we're sure your students will love. With fruit every day, and kid-friendly meals prepared in-house, our menus offer tasty variety with the best nutritional practices. Our menus are posted through the end of first semester, and these last few days before your students return to the classroom are the perfect opportunity to look at the menu together for worry-free lunch choices until December! Please feel free to call or email us with questions about ingredients or order processing. Spring is here, our garden soil is prepped, and the seedlings are starting to sprout! We're expanding our program to include nutrition education! Check out our new short cartoons! We will be giving away a free lunch each month for the rest of the school year! To enter, Like our page, posts, and photos on Facebook. You will receive one entry for every Like! Friends and family of students can Like us too, and give the prize to your student. Don't forget to check out our new blogs! Every week we post new ingredients, recipes, tips and movies to make healthy food fun and exciting! Congratulations to Andrew N. and McKenzie P., our Facebook contest winners! Your accounts have been credited for one free lunch! Our wonderful employee Esther has been taking great care of our gardens this summer! She's busy watering, weeding, and checking on all our plants, and is even finding ways to conserve our water usage and improve our composting efforts. With a little PVC pipe she's turned stagnant rain water from the roof into a water source for our garden at Woodrow Wilson Academy. Our tomato plants are growing quickly, and little tomatoes are starting to pop up. That means we'll have fresh, organic tomatoes in our kitchen in no time, ready to be turned into spaghetti sauce for school lunches this fall! Our employees work hard to deliver the highest quality food and service to your kids every day. We gave them a chance to talk about what they like most about working for My Kid's Lunch, check out this video to see what they have to say! Along with fresh, organic vegetables, we grow our own organic herbs in our school gardens. 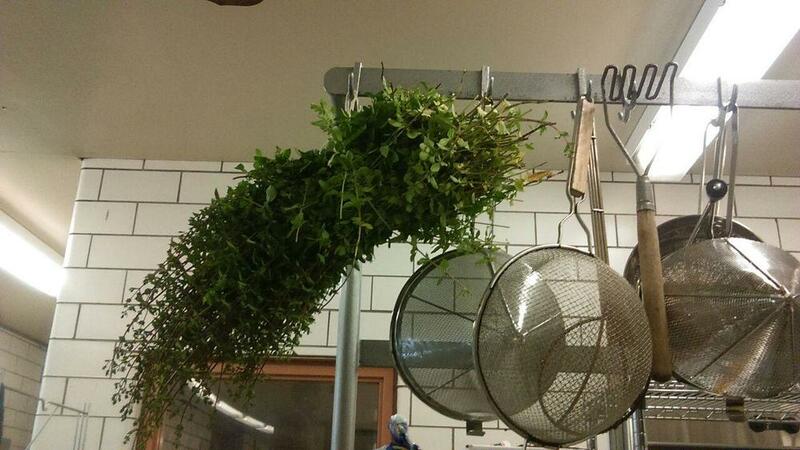 This bundle of herbs is fresh from our gardens and drying to be used in school lunches this fall. More than just flavor! Herbs are an important source of nutrients. Fresh herbs are packed with enzymes, vitamins, and minerals that add a burst of nutrition and to our school meals. Good for taste buds, good for health! Summer is officially here and that means our organic gardens are in full swing! We've been hard at work all spring planting and nurturing our little plant babies, and now they're flourishing in our school gardens. The little guys are soaking up all the rain we've had this year and growing big for school lunches in the fall! My Kid's Lunch main office has moved! To be more focused on our school lunch service, we have moved closer to our main kitchen in Arvada. 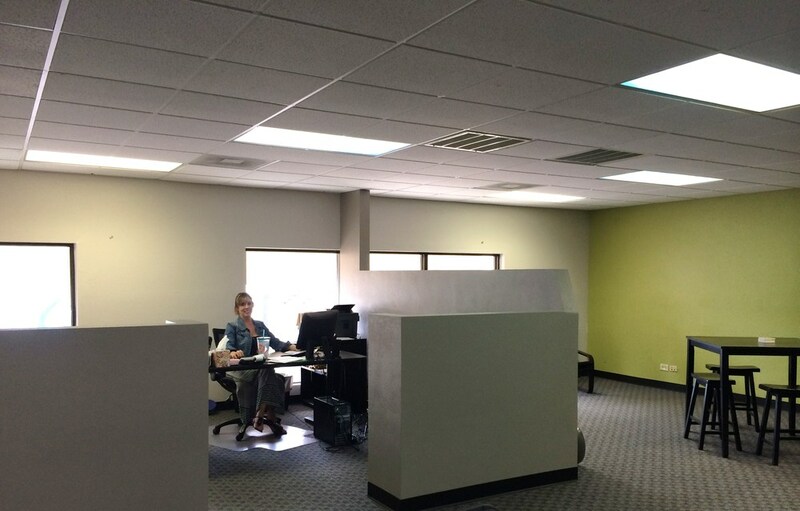 Our new place has plenty of space, and we're filling it with new support staff to better serve you! My Kid's Lunch is now offering a vegetarian option every day at select schools! Whether your student is dedicated to a vegetarian diet or you just want to incorporate more veggies in their routine, our vegetarian meals are packed with nutrient dense whole foods. 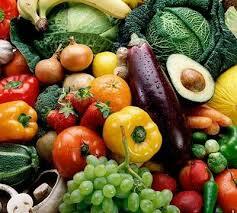 We incorporate fresh organic produce from our own school gardens when possible. Concerned about your child getting enough protein? Don't be! Vegetables and fruits provide energy and protein along with health promoting nutrients such as fiber, vitamins, and minerals. With delicious options such as mac & cheese, vegetarian chile, and black bean burgers made from scratch, there's a veggie meal for even the pickiest eaters! Vegetarian diets have proven health benefits including lower blood pressure and lower cholesterol, lower risk of cancer, and decreased inflammation. The fiber in vegetables slows the absorption of sugars in the blood stream, promoting healthy blood sugar and balanced cortisol (stress) levels. Anyone can reap some of these benefits just by swapping animal proteins for plant-based proteins a few meals per week and increasing vegetable intake. Healthy eating habits are established at a young age. Encouraging your child to eat more vegetables now can set them up to make healthy choices for the rest of their lives. Let the tasty vegetarian lunches from My Kid's Lunch show them just how delicious their vegetables can be! Garden Update: Baby Veggies are Here!! It's really feeling like summer in Denver and our gardens are soaking up the sun! Our first round of baby veggies have appeared at some of our garden locations and will be ready to pick soon. What's the fate of these beautiful organic veggies? School Lunches! We think those little tomatoes will make some delicious marinara. "Gluten Free" is the newest health trend, and although it has become a widely popular dietary choice, many people don't know what gluten really is or why it's potentially harmful to the body. I'll jump right in and say that Gluten is a protein found in wheat, rye and barley. Gluten (Latinfor "glue") is the component of wheat that gives dough it's sticky, pliable texture. Gluten is what makes pizza dough maintain it's shape, what makes bread soft and chewy, and what makes pasta noodles, well, noodley. It is found in all wheat-containing foods, including cookies, bagels, breads, and beer. Gluten's sticky texture makes it a common additives in many foods you wouldn't expect, too. Think chewing gum, toothpaste, shredded cheese, and soy sauce. Gluten is unlike any other food we consume in the effects it has on our bodies. Gluten proteins can be broken down into two components: glutenin and gliadin. The first negative effect gluten has on the body is due to the gliadin portion, which triggers increased permeability in the intestines. Gliadin activates proteins called zonulins in the intestines, which loosen the tight junctions that keep your digestive tract intact. What this means is that things that are meant to stay inside the intestines, such as food particles, can sneak out through these loosened junctions and cause problems in the body. Another characteristic unique to gluten is it's ability to affect morphine receptors in the brain. When gluten is broken down by stomach acid, it produces tiny polypeptides that can cross the intestinal lining and make their way to the brain, where the bind to the same receptors as opiate drugs such as morphine. To put it simply: gluten contributes to the destruction of your intestinal lining and binds to morphine receptors in the brain. You may have also heard about gluten sensitivities and Celiac disease. Food sensitivities occur when your immune system recognizes a food as "bad" or "foreign" and launches an immune attack, similar to what it would do to any other threat (such as a virus or bacterial infection). Symptoms of gluten sensitivity can be digestive, such as diarrhea and cramping, or can be seemingly unrelated, such as skin rash, migraine headaches, joint pain and brain fog. Gluten sensitivities vary from mild forms to the most severe form: Celiac disease. Celiac is an autoimmune disease that is triggered by the gliadin in gluten in which the lining of the small intestine is disrupted. All symptoms of any type of gluten sensitivity are alleviated when gluten is removed from the diet. Because the symptoms are so widely varying and can be different from one patient to the next, gluten sensitivities and Celiac disease commonly go undiagnosed. The negative effects of wheat don't end with gluten. The carbohydrate portion of wheat is a specific type of carbohydrate that is broken down very rapidly when it is digested. This means that wheat causes drastic increases in blood sugar, and this is why two slices of whole wheat bread (yes whole wheat) raise blood glucose more than 6 tablespoons of straight table sugar. Significant spikes in blood glucose contribute to obesity, diabetes, heart disease, dementia, and more. Not so healthy. But we've been eating wheat for years. So why is it becoming a problem now? The original strand of wheat that was cultivated by our earliest ancestors was called Einkorn and contained 14 chromosomes in its DNA. This wheat evolved only a modest amount over centuries, until the influence of agricultural science interfered through hybridization, crossbreeding, and genetic modification for the past 50 years produced the modern wheat that we consume today, called Triticum aestivum. This modern strand boasts a whopping 42 chromosomes in it's DNA and is hundreds or even thousands of genes apart from the original wheat that was naturally bread. The majority of this hybridization, crossbreeding, and genetic modification was initiated as part of a worldwide effort to reduce world hunger by increasing the yield ofcrops. The original tall, wispy Einkorn wheat stalks that you imaging blowing in the breeze across the plains have been replaced with a short, stocky, high yield Triticum aestivum that is more resistant to disease, drought, and heat. It has even been genetically modified to respond to specific brands of pesticides or fertilizers. Despite these dramatic changes in the genetic makeup of the crops, no animal or human safety testing was done on the new strains. Although yields increased exponentially and made wheat products cheap and accessible, these products were released into the food supply without human safety concerns. Fast forward to today and the effects of these genetic changes to wheat are starting to be seen. The body's immune systems doesn't recognize this genetically different wheat as food and often mistakes it as a threat. This is one reason that there has been a significant rise in the occurrence of gluten sensitivities and Celiac disease. And keep an eye out for new gluten free items on our menu this fall!! Climate change is real, and it's happening faster than anyone predicted. There's no arguing that extreme weather is becoming more severe and more frequent- from Hurricane Sandy that struck the Northeast to the arctic blast that rattled Georgia to the drought that's running it's course in California. Temperature: U.S. average has increased by 1.3 to 1.9 degrees Fahrenheit since record keeping began in 1895, and it’s expected to rise. Most of that increase starting around 1970, with the most recent decade being the warmest on record. With human-induced warming superimposed on natural climate variations, the rise hasn’t been (and won’t be) uniform or smooth across the country or over time. Extreme Weather: Heat waves and droughts have become more frequent and intense (especially in the west), while cold waves have become less frequent and intense across the country. Hurricanes: The intensity, frequency, and duration of North Atlantic hurricanes, as well as the frequency of the strongest (category 4 and 5) hurricanes, have all increased since the early 1980s. Associated storm intensity and rainfall rates are projected to increase as well. Severe Storms: Winter storms have increased in frequency and intensity since the 1950s, and their tracks have shifted northward over the U.S. Intensity and frequency of tornadoes, hail, and thunderstorm winds are uncertain. Precipitation: Average precipitation has increased since 1900, with a lot of regional variation above and below the average. More winter and spring precipitation is projected for the northern U.S. and less for the southwest. Heavy Downpours: These have increased nationally, with the largest increases in the midwest and northeast, especially over the last three to five decades. We'll be seeing Increases in the frequency and intensity for all regions. Frost-free Season: Their lengths have increased nationally since the 1980s, especially in the west. Growing season will continue to lengthen. Ice Melt: Rising temperatures are reducing ice volume and surface extent on land, lakes, and sea, and the loss is expected to continue. The Arctic Ocean is expected to become essentially ice free during the summer before mid-century. Sea Level: The global level has risen by about 8 inches since 1880, when record keeping began. It’s projected to rise another 1 to 4 feet by 2100. Ocean Acidification: The oceans are absorbing about a quarter of the carbon dioxide emitted to the atmosphere every year, and they're becoming more acidic as a result. Here are some impacts that are specific to geographic regions. These effects have socioeconomic as well as ecosystem consequences. Northeast: Heat waves, more extreme precipitation events, and flooding from sea level rise and storm surge. Southeast and Caribbean: Increased risk from hurricanes, decreases in water availability with increases in water competition. Midwest: Increases in crop yields from longer growing seasons and rising carbon dioxide levels will be offset by heat waves, droughts, and floods. Great Plains: Rising temperatures lead to increased demand for water and energy, along with increased impacts on agricultural practices. Southwest: Drought and increased warming foster wildfires and increased competition for scarce water resources. Northwest: Earlier snowmelt and changes in streamflow timing will reduce water supply in the summer. Alaska: Rapidly receding summer sea ice, shrinking glaciers, and thawing permafrost damages infrastructure and changes ecosystems. Hawaii and Pacific Islands: Increasingly constrained freshwater supplies and increased temperatures will decrease food and water security. Coasts: Water supply infrastructure and evacuation routes are increasingly vulnerable to higher sea levels and storm surges and inland flooding. There is great controversy in regards to the role that we as humans play in climate change. It is true that Earth does have natural cycles of climate change, but never before in recorded history have changes occurred so quickly or so violently. Scientific data points towards humans as significant contributors to the abrupt changes that are happening. Carbon emissions, agricultural practice, energy production, and ocean pollution are a few things on the long list of human activities that are contributing to climate change, and the outcome is devastating. In order to leave behind a livable world for future generations it is essential that we spread awareness and take steps to decrease our impact on the environment. Curious about your impact on the planet? Your "Carbon Footprint" is an estimate of the greenhouse gases that are produced from your daily activities. Click here to calculate your own carbon footprint. At My Kid's Lunch we are dedicated to minimizing our impact on the planet. Serving healthy, delicious meals is our first priority, and we strive to do so in a manner that promotes the health of our planet as well. You can make a difference! When it comes to taking care of our planet, every little bit helps. Things like turning off lights when you leave the room, turning off appliances when not in use, taking shorter showers, and carpooling all add up to make a big difference in your carbon footprint (and saves major $$ too!). You Check out 50waystohelp.com for more simple strategies to save money and the planet! My Kid's Lunch's newest garden is officially up and running at Holy Trinity Catholic School in Westminster! Holy Trinity Principle Tate Hallahan teamed up with Michael and our Arvada kitchen manager, Deb, to turn an empty grass field into a garden full of baby veggies that will one day end up in meals for My Kid's Lunch students. The team started by removing the grass and tilling the soil to get it ready for planting. Then they covered the freshly tilled soil with a ground cover to prevent the growth of weeds and to make maintenance of the garden quick and easy. With the ground cover in place, the garden was ready for plants! Baby plants from Michael's home nursery (check out our earlier post here) were planted in the fresh soil, and a protective fence was put in place to keep out hungry little critters. In just one day, the hard work from My Kid's Lunch and Holy Trinity turned an empty field into a garden that will produce fresh, organic vegetables and valuable and fun learning experience for the students of the school. Does your school have a little extra space? My Kid's Lunch welcomes gardens of all sizes! You provide the space & the access to water, we'll take care of the rest! Get students involved by having "field trips" to the garden or offering an Organic Garden Club where students can take part in caring for the plants. Give students the opportunity learn about the ecosystem and nutrition right on their own back yard! Email Michael for more information (msudak@hotlunchonline.com) or download our Organic Garden Club Agreement at the bottom of the page. At My Kid's Lunch, we don't believe in cutting corners for convenience at the cost of quality. We believe that lunch is a meal that shouldn't come in a wrapper, and neither should the ingredients used to make it. With 18 years of experience under our belts, we've developed delicious, from-scratch recipes that call for the best ingredients available. We even make many of our breads, sauces, and dressings in house! Our recipes are tailored to the tastes of the children we serve, and our menus are designed to offer options for even the pickiest eaters. Creating meals from scratch requires extra time and care, but our amazing kitchen staff works hard to make sure the meals we deliver to students are both healthy and delicious. Our staff does all the chopping, mixing, preparing, and cooking that goes into producing homemade meals. No emptying containers of frozen foods into fryers in our kitchens! Our meals are 100% free of trans-fats, hydrogenated oils, fried foods, and high fructose corn syrup. We serve only hormone free milk, and have replaced sugary dessert items with homemade whole wheat or gluten free chocolate chip cookies. We go the extra mile in the kitchen to give you the confidence that your child's school lunch will delight their taste buds and nourish their bodies! What’s the fuss about organic? The organic food movement has taken over the US food market, with organic labels showing up in grocery stores, restaurant menus, and news headlines. We’ve heard that organic foods are better for us, but many of us don't know why. WHAT IS ORGANIC? Organic produce and meats are produced without the use of synthetic insecticides, herbicides, antibiotics, growth hormones, or medications. Organic farmers use natural fertilizers and practice methods such as crop rotation to control disease, pests and weeds among their products. WHY DOES IT MATTER? Residues from traditional insecticides and herbicides can remain on many fruits and vegetables, and antibiotics and growth hormones accumulate in the muscles of the animals that become our meat. When we consume conventional produce and meats these chemicals and synthetic substances enter our bodies and can have damaging effects. At My Kid's Lunch, we strive to produce the healthiest and best tasting meals, and this means incorporating as much organic produce and meat as possible. We even use vegetables grown in our own organic gardens! HOW CAN I EAT ORGANIC AT HOME? Though the high demand for organic foods has driven prices down, organic food items often have higher prices than their conventional counterparts. Keep your food safe and your grocery costs down by following the rules of the DIRTY DOZEN and the CLEAN FIFTEEN. If purchasing organic is out of your budget, thoroughly washing your fruits and vegetables can help get rid of harmful pesticide residue.